Thermilate Thermalmix Insulating Paint Additive is a revolutionary paint additive that makes almost any paint or coating insulate. It cuts down energy use and reduces heat loss through your walls and ceilings, therefore helping to reduce your energy bills. Thermalmix has been independently tested and scientifically proven to work by world leading laboratories and government bodies. By using the latest NanoCNB insulating technologies to create an effective thermal barrier, Thermalmix prevents heat loss through your walls and ceilings. Room temperatures typically increase by up to 2 to 3°C, and stay warmer for longer. Thermalmix is for domestic and commercial use, and can be applied almost anywhere conventional paint and coatings are used. 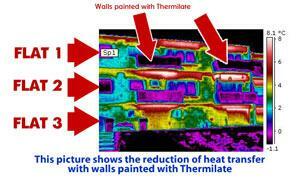 Thermalmix is also used in hot countries on the exterior of buildings to reflect heat away and keep the inside cooler. Thermalmix is very easy to use and can be mixed with virtually all paints and coatings. The contents of the bottle should be gradually stirred into 5 litres of paint or coating. Empty the paint into a large bucket. Empty a bottle of Thermalmix into the same bucket. Mix using a manual hand paint stirrer or use a drill based stirrer. A minimum of two coats of paint containing Thermilate should be applied to achieve maximum thermal efficiency. Thermalmix gives a very slight textured feel, so perfect for covering minor imperfections. However, for a flatter finish, simply apply a final third coat of paint without Thermalmix mixed in to it.